Softphones are software applications that can be run on your PC or smartphone to handle phone calls. Think of Skype, probably the most well-known softphone. My goal was to choose a softphone that was configurable to use with any SIP based service, and configure it to connect with my Asterisk PBX. That way I could emulate a typical office environment where I could take calls at my desk or on the road with my iPhone.After reading reviews on many different applications I decided on Bria, which is designed by Counterpath. I liked that is was highly configurable and available for Blackberry, Android and iOS devices. The fact that it is used by so many different VoIP providers also swayed my decision. First the cost. In the days of free apps, and indeed there are plenty of free softphones, Bria is not one of them. The Bria SIP softphone for iOS devices costs $9.99 per year, which may seem expensive at first glance, but don’t let this sway your decision. Remember this gets you support and software upgrades, and the latter is really needed these days when considering all of the iOS and Andoid updates each year. Creating and configuring a new SIP account is simple, as highlighted in the figures 1 and 2 below. I called my account Asterisk since it is an Asterisk PBX that I am connecting to. Display name can be anything you like, username would be the username that a SIP or VoIP provider gives you and same for password. In the case of my Asterisk PBX, I am responsible for the creation of the account username and password, and the username is simply the extension number I set up. The domain is normally set to the domain or IP address of your PBX or if you are communicating directly with a SIP service, use the domain of their server, for example sip.providerABC.com. 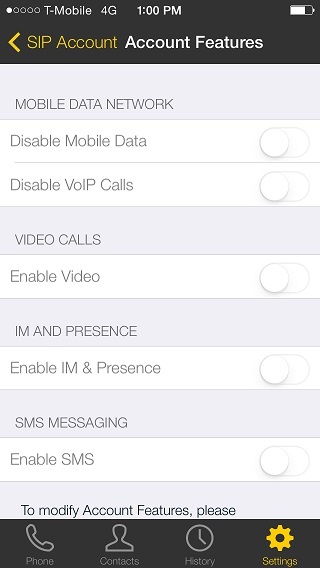 Make sure you do not disable the mobile data or VoIP calls in the account features section. Below in figures 3 and 4 you will find some additional settings that should be configured. Make sure the “mobile data network” and the “Allow VoIP calls” settings are enabled if you are out of WiFi range and need to use the your cellular data plan. 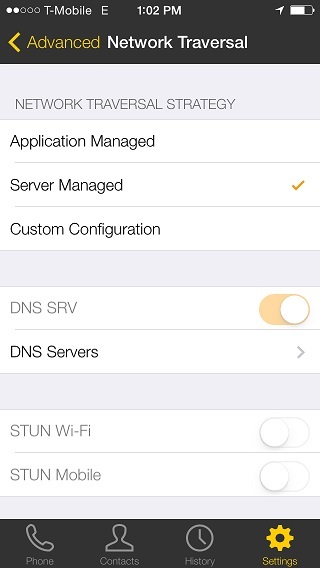 For the Network Traversal, initially select the “Server Managed” setting but this may be altered to custom configuration on your behalf, particularly when using a cellular connection rather than WiFi. 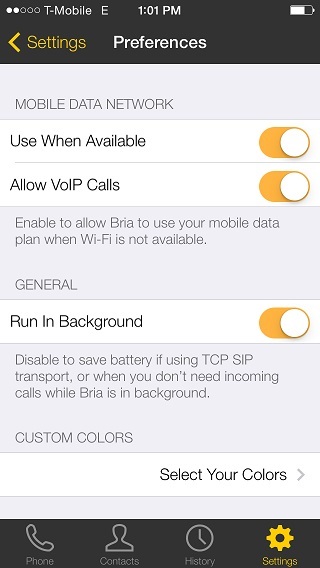 The Bria SIP softphone can sense if there is an issue with the call and will ask you if you want it to modify the settings for ICE, STUN and DNS SRV. It will then run through combinations for you, with your assistance, to optimize the quality of the calls. I found this really useful when I was having intermittent audio problems when using my cellular data network. In WiFi mode I had no such issues. When you have configured the settings, you must register the account with the SIP service provider. Click on the information icon next to your account in the softphone and press register. If successful it will indicate “Registered” under the status field. If you are having issues registering the account, make sure your account settings are correct with your SIP service provider and that you are either connected over your WiFi network or your cellular data network. Make sure notifications are enabled for the Bria application on your iPhone. For incoming calls, the notification icon will display on your device when a call comes in, simply touch it and you will answer the incoming call. 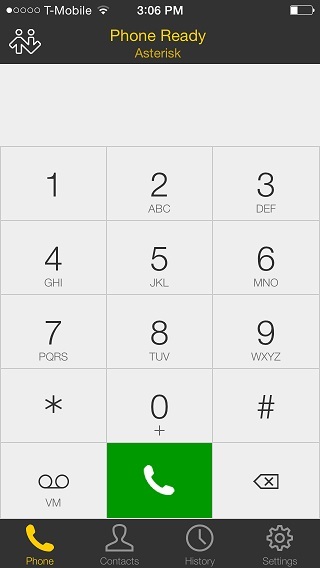 When making calls, simply press the phone icon on the screen and enter the number you wish to call, as per the figure below. The Bria softphone application for the iPhone is impressive. It has a vast set of features, supports multiple accounts and is great value at only $9.99 year (or 99c/month). 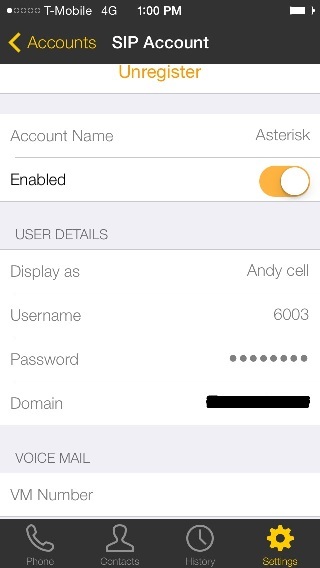 I managed to successfully register my Bria SIP app as an extension to my Asterisk PBX server and could make and receive extension based calls and external phone calls direct from the application. The diagnostics feature helped iron out some small intermittent audio problems on the cellular side, the WiFi calling was extremely clear and high quality.